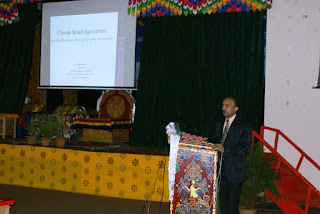 Climate smart Agriculture is about making smart choices in agriculture techniques to address climate change. Organic agriculture technologies blended with traditional knowledge provides many low-cost options. Moreover these low-cost approaches can empower the farmers by being less dependant on the external farm inputs resulting in empowering them. Bhutan is highly vulnerable to the impact of climate change. It is widely recognized that Himalayan countries will suffer disproportionally. Agriculture is one of the sectors which will need to brace itself for unpredictable rainfall patterns, droughts, untimely hot and cold spells, irregular water supply from rivers and natural sources, increased pests and diseases and increased disruptions from wildlife. But agriculture is also a cause of climate change: it accounts for about 14 percent of greenhouse gas emissions, or approximately 30 percent when considering land-use change, including deforestation driven by agricultural expansion for food, fiber and fuel (IPCC, 2007). However, agriculture can be a part of the solution if climate smart agriculture technologies and approaches are introduced. Climate smart agriculture can contribute to both climate change adaptation and mitigation. Moreover, it befits Gross national Happiness (GNH), an unique paradigm of development of Bhutan. The livelihoods of farmers can be improved by climate smart technologies, which integrate the need for sustainable food production and economic development while also increasing agro-ecosystem resilience to climate change impacts (adaptation) and reducing greenhouse gas emissions by agricultural production systems (mitigation). Capacity building of stakeholders is key to sustainable impact ; climate smart agriculture approaches and technologies are ‘knowledge intensive’ rather than input intensive. I am sure you will like my presentation.